"As a Subscriber between the age brackets of 18 to 60 years of age, you can procure your PRAN application form from any of the Point of Presence - Service Providers (POP-SP) you wish to register with. You can also procure the PRAN application form from our website by clicking here." "You have to ensure that your PRAN application form is filled up i.e. photograph, signature, mandatory details, scheme preference details etc and also submit KYC documentation with respect to proof of identity and proof of address. For detailed information on NPS, please refer to the offer document prescribed by the Pension Fund Regulatory and Development Authority (PFRDA)." You can go to your nearest POP-SP and submit the PRAN application along with the KYC documents. PRAN card will be sent to your correspondence address by CRA. You are required to make your first contribution (minimum of Rs 500) at the time of applying for registration to any POP-SP. For this, you will have to submit NCIS (Instruction Slip) mentioning the details of the payment made towards your PRAN account. Any citizen of India between the age of 18 to 65 can open NPS account by visiting any POP-SP. 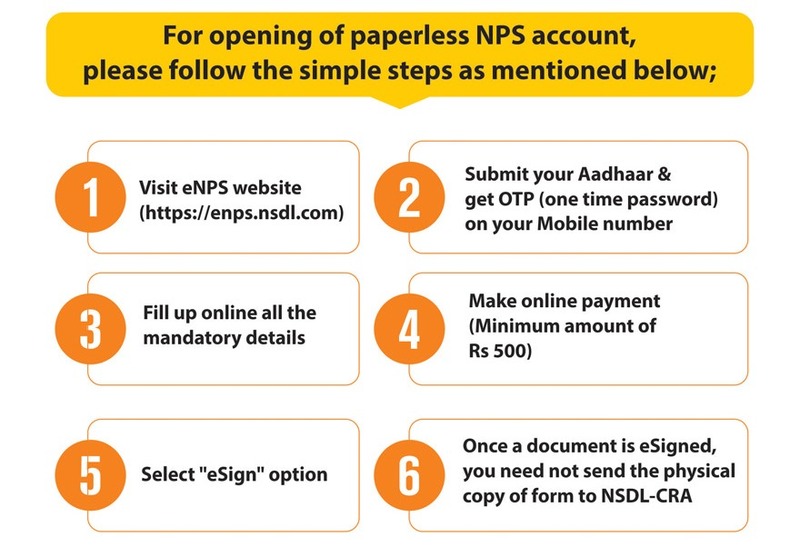 Subscriber can open NPS account online by visiting eNPS website through Aadhaar or PAN & Bank details.